What is Mental Health Awareness Month? It's an idea that me and Ula came up with to draw attention to all things MH. It doesn't get enough attention and there's still far too much stigma attached to it! I thought the best way for us book bloggers to do this was to dedicate June to reading and reviewing/ discussing books that discuss Mental Health. There's going to be a variety of things going on on mine and Ula's blogs, as well as others. 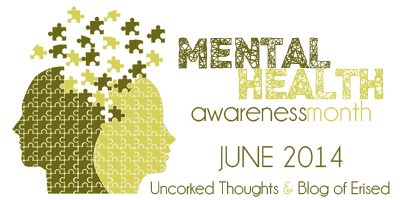 There will be guest posts, interviews, giveaways, challenges and all sorts of events going on as well as reading books that explore issues of MH! It starts June 1st and runs through until the 30th of June. There aren't any rules really! Whether you're a blogger, vlogger, on Goodreads, an author or anything feel free to take part! The more the merrier. The aim is to spread awareness about Mental Health! What books are there on MH that I can read? We're going to be using the hashtag #MHAMJune on Twitter when talking all things MH! If you're participating, use the code for the button below! June's a busy month for me but I'll ahve a think about what I can do. Maybe I can get some guest bloggers on for when I'm on holiday. This sounds awesome! Mental Health is something I feel quite strongly about, so I'm so glad you're hosting this! I'll definitely be taking part! I have two books from your list already, and I'll check out your shelf on Goodreads to see if I have any others. Thanks! Ooh! I'm pleased to say I've read a few from your list. I'll definitely be reading more especially. Such a brilliant idea! This is something I'm searching for too. Will Grayson, Will Grayson by John Green and David Levithan feature one of the Will's suffering with depression. There's Two Boys Kissing by David Levithan too. I've yet to read it but I hear Fan Art does. Amy & Matthew features a boy with OCD. Forgive Me, Leonard Peacock, It's Kind of a Funny Story. Hope these work for you! And by that I mean I found it through your shelf, oops. I completely forgot what I was doing for a second after I lost myself reading the Kindle sample of that book. Anyway, yeah, I wouldn't have found that book if not for you. Thank you for putting that shelf together! (: I'll probably spend lots of time perusing that shelf, haha. Hahaha no problem! I just wanted to make it easier for everyone to find books on the topic :) hope you enjoy your book! Great idea, I'll definitely be trying to take part in this. I have a few of the books you mentioned and haven't read them yet, so that will be perfect. If we wrote a piece on the fiction books about Mental health that we stock in store, would that help? I'm sorry to hear that you've struggled with mental health issues so much :(. I personally have anxiety and panic attacks which can be a nightmare. I've just found out about this and would love to join in please if I'm not too late. I think it's a brilliant idea. MH is something which is close to my own heart and has affected and still affects my life. Awww no :(. We're hoping to run it next year too so fingers crossed! I saw your link on The Pegster Reads. I'm pretty booked for June in terms of my own blog, but I've subscribed to yours and hope to visit a lot of other participants during the month. Thanks for having this link-up. I'm so sorry I'm late. But I think this is such a wonderful event. I'll write about it in my blog and link up some reviews to spread the word!